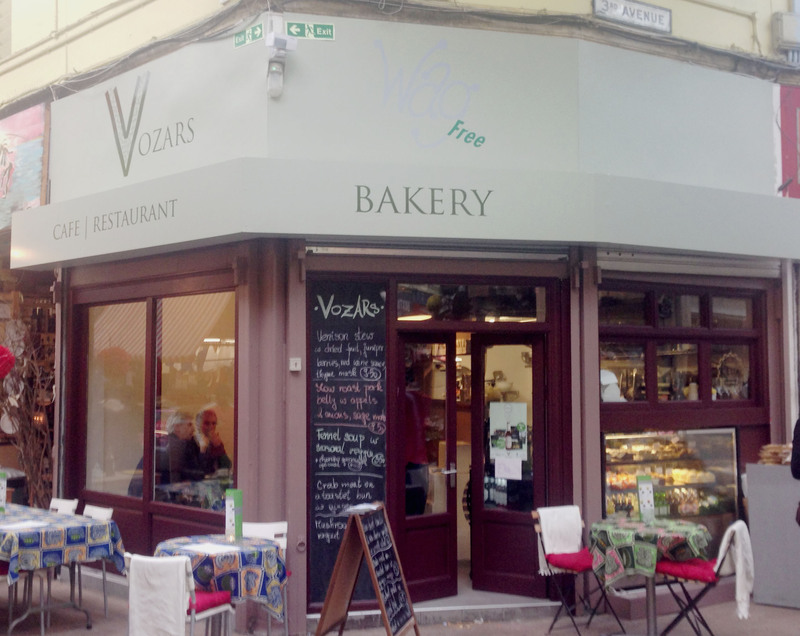 To most of our readers this may be known as WAG (Wheat and Gluten free café), which was famous for its cakes. It has recently undergone a metamorphosis and become an evening restaurant as well with space for eating inside – a boon in these chilly months. The tables in the cosy space seat (or perhaps squeezes in) 12 people with space outside for about another ten. Each table is adorned in a pretty colourful table cloths and nothing more. This is an unusual restaurant that still caters for gluten free eating and can also do dairy free and vegetarian ….. although vegan might be a problem. The chef is from the Slovak Republic and has devoted his skill to perfecting meals that cater for those concerned with gluten. As one of us has problems we wished this sort of restaurant had been available 15 years ago when gluten free food was mainly acquired on prescription. There is a varied menu of starters with salads, quiche and crab buns. 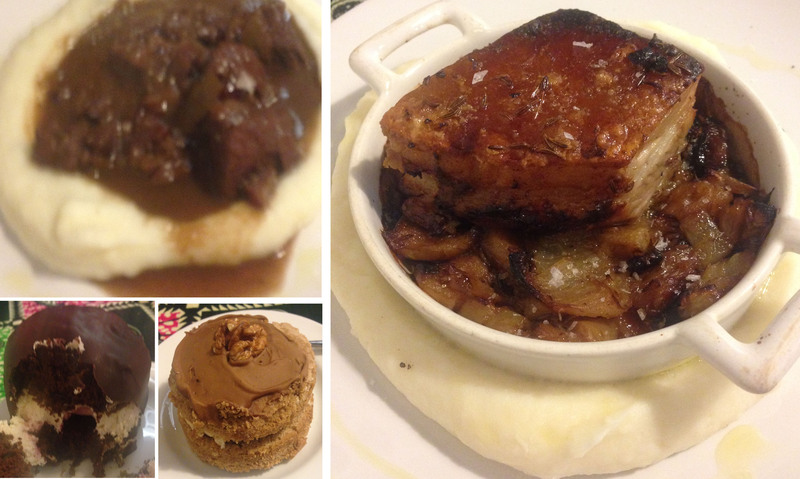 The main courses are mash and meat (literally) or a vegetarian option (including the option of dairy free) and they offer their delicious cakes as desserts. I often end up ordering a main course with the sole criterion that it comes with mash so I was delighted at all the choice. When we visited the mash came in different flavours – thyme, rosemary and hibiscus. We chose a salad to share, venison stew with rosemary mash and pork belly and caramelised onions with thyme mash. The salad was plentiful and in fact the starters are described as plates to share. The main courses provides a ring of tasty mash with the meat in the middle and for my venison stew they provided a spoon (the gravy was delicious). The flavour of the mash was subtle which was fine as any depth of flavour would have overwhelmed the meat.The pork was very tasty but could have been a bit crisper. The venison stew smelt and tasted wonderful. I was concerned there might be too much clove but the cranberry, juniper and plums balanced it out perfectly. It wasn’t at all sweet and the meat was cooked to perfection. No other vegetables were provided apart from the mash despite pictures on the website – but we didn’t miss them. This was all washed down with a glass of Spanish red and Celia lager (also gluten free and suitable for Vegans!). No-one should leave this restaurant without trying the cakes (made for Brixton and Selfridges). So our desserts were from the long list of favourites available in the café (Victoria sponge. lemon cream cake. brownie, etc). We chose a coffee and walnut cake and a black forest gateau. Often gluten free cakes are worthy rather than being delicious – not the case here. The black forest gateau defeated us as the portions are large but it was not without trying very hard. The desserts were washed down with tea chosen from eight options with names like Lily Fairy and Heart’s Desire. There are of course coffee and less exotic varieties of tea available. Our choice was Flower Lover which is a mixture of green, chrysanthemum, jasmine and globe amaranth, which starts out as a ball in a large wine glass but slowly unravels as you pour in the hot water and finally sways like pretty seaweed. The smell was mainly jasmine but it was full of flavour and complemented the chocolaty and creamy cakes. The whole meal including cakes was £42.00 and they take credit cards. We will certainly visit again and we now know that you can order gluten free cakes large enough for a birthday party. So no more struggling in the kitchen to produce a rather inferior, but worthy, effort again. It is now open in the evening from Wednesday to Saturday and Tuesday and Sunday during the day. You can buy cakes to take away at any time. ps. Sorry for the poor photograph of the venison.